By Janet Fletcher: Andante Dairy's Melange is a subtle, petite cheese, made from roughly equal parts cow's and goat's milk, weighs in at just over 4 ounces. That's the perfect size for two at the end of a meal; with other cheeses on the tray, it will satisfy four. 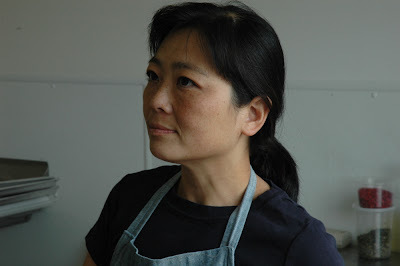 Andante cheesemaker Soyoung Scanlan uses goat's milk from the Petaluma farm where her cheese plant is sited and rich Jersey milk from neighboring Spring Hill Dairy. So the milk does not travel far, a factor in quality cheesemaking. The milk is pasteurized, cultured and allowed to ferment slowly; it takes 15 to 18 hours to build up enough lactic acid to coagulate the vat. Milk for Cheddar cheese, in contrast, might be inoculated with enough culture and rennet to produce a curd in under an hour. The extended fermentation encourages flavor development and yields a more tender curd because so little rennet is used. For a rough analogy, think of an acid-coagulated curd as resembling a fragile custard while a rennet-coagulated curd is more like Jell-O. The curds are hand ladled into molds, not pumped, a step that preserves their integrity. Over the next 2 1/2 weeks, a thin coat of white mold will envelop the little rounds, signaling the spread of Penicillium candidum. Although the Penicillium spores are present in the dairy, Scanlan also inoculates the milk to ensure that the bloomy rind develops promptly. In less than three weeks, the cheeses are wrapped and out the door. Melange measures only about 2 1/2 inches in diameter and less than 1 inch in height. To protect it from drying out before it reaches the consumer's table, Scanlan wraps the cheese in plastic, but that is not ideal. It wants to breathe. If you do not plan to serve it immediately, take it out of the plastic and put it in a lidded plastic container to give it a little more breathing room. Refrigerate it, but bring it to room temperature to serve. 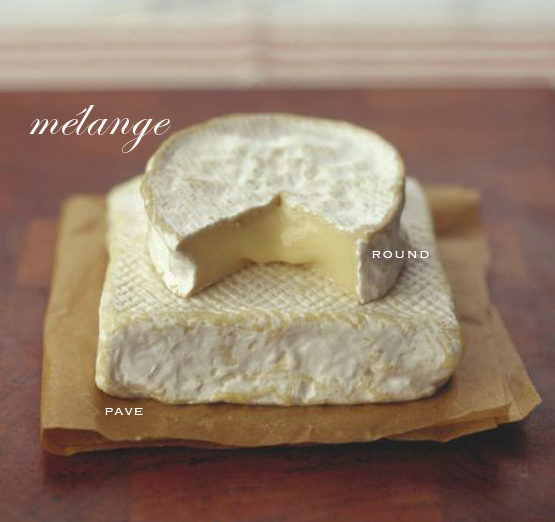 As Melange ripens, it softens from the outside in, so a ready-to-eat wheel should yield to gentle pressure. I like to see a little golden mottling on the rind; more than a little and the cheese is probably too advanced. Internally, Melange should be semisoft and creamy, with a pleasant sour-cream aroma and a lactic tang. Scanlan says she eats the rind, but you can cut it away if you prefer. It wants a white wine with a creamy body but not a lot of oak, such as a Viognier or other Rhone or Rhone-style white wine.